Often in mixed forests (“hemlock-white pine-northern hardwoods”) but also on sandy plains and dunes with red and sometimes jack pine, bogs with tamarack, in swamps (mixed or on banks, rather than deciduous swamps or floodplains), on rock ridges, and even in cedar swamps. 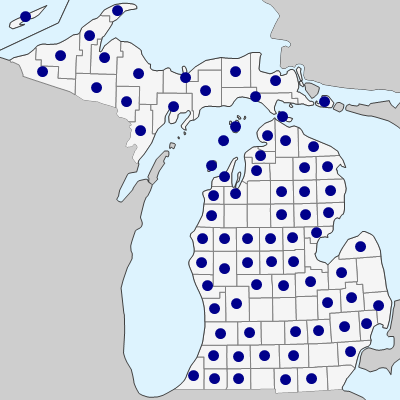 Records from Hillsdale, Jackson, Lenawee, and Wayne Cos. are probably all of plants spreading from cultivated trees. 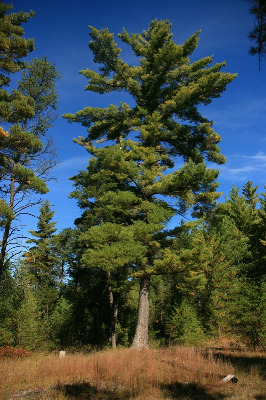 The familiar and important white pine is the official state tree of Michigan. It is a fitting designation, for this was the backbone of the lumber industry, particularly in the last quarter of the 19th century, when Michigan led the nation in lumber production. Here were the finest stands of this species in the world: trees attaining at their best 1.5–2.1 m in diameter and 45–60 m in height (although usually smaller). Branches at the top of tall trees in exposed situations are generally bent away from the direction of the prevailing winds, producing a characteristic and picturesque shape, which makes it possible to recognize white pine even at a distance or in silhouette along shores and dunes or towering above a forest canopy. The needles of white pine are lighter in color, softer in texture, finer and less stiff than those of our other species. MICHIGAN FLORA ONLINE. A. A. Reznicek, E. G. Voss, & B. S. Walters. February 2011. University of Michigan. Web. April 18, 2019. https://michiganflora.net/species.aspx?id=1925.